Philadelphia Phillies right fielder Bryce Harper reacts after hitting a three-run home run during the third inning against the Washington Nationals at Citizens Bank Park. After a 4-0 start to the season, the Phillies are just 3-3 over their last six games — and a pair of those losses, including their most recent 10-6 loss to the Nationals on Tuesday night, have been somewhat concerning. Still, despite their best pitcher, Aaron Nola, getting off to a terrible start, and their bullpen looking like more and more of a liability, the Phillies remain a half game ahead of the Braves in the NL East, in part thanks to their offense and some solid pitching from their other four starters. Despite a relatively mediocre week that saw them blow a pair of games to the division rival Nationals and saw their offense cool off considerably after getting off to a red-hot start, the Phillies are still getting a lot of respect from the national media. Sure, they may not be taking home the top spot like they did in several of last week's power rankings, but they also aren't any lower than third in any of the rankings mentioned below. NOTE: Some of these rankings may have come out a day or two ago, and may not be taking the most recent game into account. 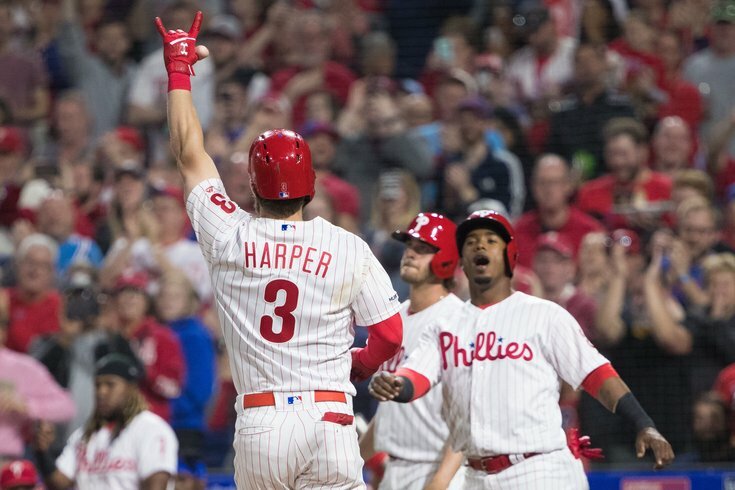 Staff 10 (+8) Has Bryce Harper made a good first impression with the volatile fans in Philadelphia? Three majestic home runs and a .556 on-base percentage say yes. That doesn't mean those passionate fans don't have someone to boo. David Robertson was tasked with sealing the back of the Philadelphia bullpen. Instead, he has a 9.82 ERA, with 12 baserunners allowed against 11 total outs. Alyson Footer 10 (+8) The Phils have yet to lose consecutive games, and they’ve been coming through in the clutch. Philadelphia's .455 on-base percentage with runners on base is 45 points higher than the league's second highest. Mike Oz 1 (-1) Bryce, Bryce, Bryce, but yo holmes, let’s talk about Rhys Hoskins, who has 13 RBIs now that Harper is hitting in front of him. Maikel Franco also has three homers and 10 RBIs. This Phillies lineup is the real deal. Drew Silva 3 (+1) Rhys Hoskins continued the early-season slugfest with a pair of solo home runs in Monday night's 4-3 victory over the Nationals... He was a fourth-round pick in the average Yahoo draft this spring and seems fully capable of providing second or even first-round production hitting behind the likes of Andrew McCutchen, Jean Segura, and Bryce Harper. Matt Snyder 1 (-2) In 12 innings so far this season, Zach Eflin has allowed just one run (0.75 ERA), nine hits and one walk (0.83 WHIP) while having struck out 14. Jesse Yomtov 5 (+2) Offense has been as good as advertised. We will add Bleacher Report and any others as they become available. MORE: Hagen: How does the enigma of Vince Velasquez fit into the 2019 Phillies? | MLB rumors: With Dallas Keuchel's asking price reportedly down, will Phillies pounce?